When your drain gets clogged, then call on the professionals at Bluewater Plumbing, Heating, and Air Conditioning. We offer fast, efficient service for drain cleaning in Queens and the surrounding areas of New York, available for both residential and commercial properties. Our certified staff has extensive experience cleaning out all types of drains in both residential and commercial properties. We use the most advanced technology and equipment in the industry in order to effectively clean out any drain while preserving your pipes. We provide a thorough cleaning of your entire plumbing system from top to bottom. 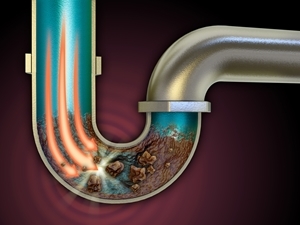 With our drain cleaning service you can be assured that all blockage and buildup is complete cleared away and that your pipes are cleaned on the inside. This gives your system a fresh new start and allows water to freely flow throughout your entire system. If you're having issues with tree roots or debris blocking your system at it's base, then we utilize advanced drain clearing technology to complete clear out all stubborn debris in your home or business plumbing. In many homes the garbage disposal is the component in your plumbing that receives the most abuse. Many home homeowners will shove items in the disposal that clog it up. Some items include cooked noodles, cigarette butts, grease, bones, egg shells - the list goes on. When your garbage has had enough, it will cease to operate. It is essential to hire a professional in order to keep your garbage disposal from becoming permanently damaged and costing you in major repairs or replacement. We provide full garbage disposal repair that totally restores your garbage disposal and gets it to working once again. Many times when a your drains are clogged, it's easy to go to the nearest store pick up a home remedy and pour it down the drain. While these methods do provide short term bandaids for slow drains and occassionally fully clogged drains, they don't necessarily fix the problem. Simply put, DIY drain cleaners and unclogging tactics just don't provide long-term solutions. It isn't long before your drain is clogged again, and you're wondering why it isn't fixed. Hiring a an experienced Queens plumber insures that the job is done right and the real problems are solved. At Bluewater Plumbing, Heating, and Air Conditioning we use only environmentally safe drain cleaning solutions that will not corrode your pipes and cause them more problems. Call us today to learn more about this and to schedule plumbing services in Queens or any of our service areas throughout New York. If you would like to schedule professional drain cleaning in Queens or the surrounding areas, please call 866-763-5302 or complete our online request form.